LAWRENCE BRENT BRILLIANT, M.D., is the President of the Skoll Urgent Threats Fund and Senior Adviser to Jeff Skoll. In this role, he will develop the strategy and approach for the newly launched Fund, as well as advise Jeff Skoll on ways to leverage his various commercial and philanthropic entities to drive positive change on urgent social and environmental issues. Prior to joining Skoll, Brilliant served as the inaugural Executive Director of Google.org and, later, Chief Philanthropy Evangelist, working with the company's cofounders to define the mission and strategic goals of Google's philanthropic efforts. This included overseeing the Google Foundation, Google Grants, and the company's other major social change initiatives. 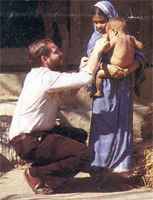 A physician and epidemiologist, he has been Associate Professor of Epidemiology, University of Michigan; Medical officer, WHO SEARO smallpox eradication team; Founder, Seva Foundation (which has done 2 million free sight restoring eye operations in India and Nepal). He is the author of two books and dozens of articles on the epidemiology of smallpox, blindness, and environmental diseases; and he has worked at city, county, state, federal and international levels. 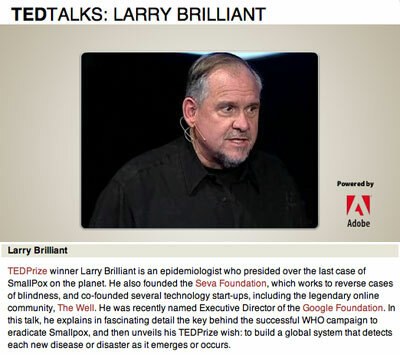 As a technologist, Larry Brilliant was the co-founder with Stewart Brand of The Well, an early Internet online community; has served as CEO of two public technology corporations (SoftNet Systems, Inc. and Network Technologies); and has been a Director of several non-profit charities and for profit technology companies. Dr. Brilliant has recently been written about in publications as diverse as the New York Times, the Wall Street Journal and the Yoga Journal. He has appeared on CNN (Paula Zahn), CNBC, MSNBC, and "Power Lunch" within the past year. He is the author of Sometimes Brilliant: The Impossible Adventure of a Spiritual Seeker and Visionary Physician Who Helped Conquer the Worst Disease in History. Interim CEO of Cometa Networks, Inc.